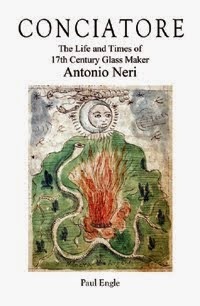 In his 1612 landmark book about making glass from raw materials, there is a specific term that Antonio Neri uses repeatedly: "diligence." I count forty-two distinct instances spread throughout the book. Even so, in all of these occurrences, not once does our priest-alchemist uses this term in a casual manner; each appearance is in a critical step, in which he urges his readers to pay extremely close attention to what they are doing. If you want to have fine crystal, then in this you must exercise great diligence; when the frit is made with this careful attention, it will be white and pure like snow from heaven. 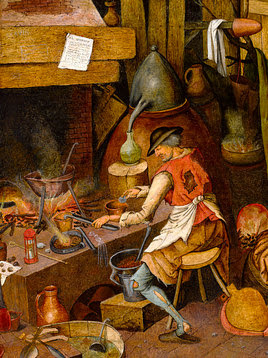 Then you must stir the glass with a paddle, but when the tinsel is calcined well and as directed, it swells so much that it could make all the glass go out of a large crucible. So use diligence in this. All lead precipitating out of the glass must be removed with diligence, throwing it away, so that it does not make the bottom of the crucible break out, as can happen. One might well ask, why so much attention to diligence? To be sure, there are many important aspects to the successful outcome of a batch of glass. Yet Neri singles out the seemingly simple act of paying attention. One reason is to avoid disasters. The last two quotes above imply that he has seen his share of these. There is no question that glassmaking is a technically demanding process, where many things can go wrong. But there is more to it than that; Neri’s admonitions may have more to do with developing the proper attitude in a glassmaker. At first, it might seem that a recipe is a recipe is a recipe and as long as one follows it, mental state has no bearing on the situation. Yet as surprising as some may find it, this is definitely not the case. Materials and conditions vary in ways that cannot always be measured. What a recipe specifies is strictly limited by our perceptions and to quote the bard, "There are more things in heaven and earth, Horatio, than are dreamt of in your philosophy." Unlike some more intellectual pursuits, glassmaking falls into a category of activity in which there is no room for self-indulgence. It does not work to throw the ingredients into a furnace and walk away, assuming that they will react the way we anticipate. They will react, rather, according to the physical laws of nature. Diligence could make the difference between a minor correction and a disaster. For the headstrong, this can be a rude awakening. A would-be glassmaker is forced into a confrontation with stark, unforgiving reality. What one wants or expects has no bearing on the situation, only what one does, and when. Neri makes clear that this philosophy of diligence is not only required by the novice, but also by the seasoned professional conciatore. This entire exercise depends on the practice of being a worthy and diligent glass conciatore, because neither sure weight nor measure can be given. The diligent furnace conciatore will meticulously remove any lead that has returned to its metallic state from inside the pot. When working this glass, use the same diligence that the skilled masters use and in so doing you will make material that is perfectly true to the jasper, agate and chalcedony of the orient. In the early seventeenth century, to be a glassmaker meant becoming a careful observer, ever mindful that Nature does not care a whit about the way you think things should work.